Bacterial etiolation, caused by Acidovorax avenae or Xanthomonas translucens pv. poae, is a problematic disease of creeping bentgrass (Agrostis stolonifera) and annual bluegrass (Poa annua) turfgrass stands. 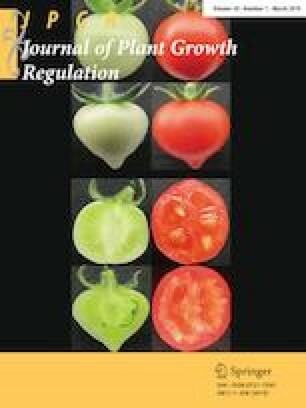 The objective of this study was to determine whether temperature may play a role in phytohormone production by these bacteria and to determine if there is any change in phytohormones specifically in etiolated plant tissues. In vitro, A. avenae and X. translucens were cultured at 25, 30, 35 and 40 °C for 14 days. Bacterial cultures were sampled for gibberellic acid isoforms (GA1, GA3, GA4, and GA20), jasmonic acid, salicylic acid (SA), indole-3-acetic acid (IAA), zeatin riboside, and abscisic acid (ABA). No phytohormones were detected in pure cultures of X. translucens, whereas A. avenae produced GA1, GA3, GA4, and IAA. Acidovorax avenae isolate MSU-13 produced significantly higher GA1 and GA3 at 35 and 40 °C on most days measured. In the field study, etiolated stem and leaf tissues of creeping bentgrass and annual bluegrass were evaluated for bacterial identification, etiolation ratings, and phytohormone quantification. Significantly more etiolation symptoms were observed in both annual bluegrass and creeping bentgrass on days with higher temperatures. In annual bluegrass, etiolated stems and leaves showed significantly higher GA1, GA3, etiolated leaves showed significantly higher GA20, ABA, and lower IAA compared to normal turf tissues on most experimental dates. In creeping bentgrass, higher GA1, GA4, SA, ABA, and lower IAA were detected in etiolated turf tissues than normal tissues on most experimental dates. Plant hormone regulation due to the presence of bacteria may be altered differentially in response to different bacteria species eliciting similar plant symptoms. The authors wish to thank the Michigan Turfgrass Foundation and AgBioResearch of Michigan State University for funding of this project.